Huntington, WV – Austin Peay State University’s gifted track athletes showcased what they could do against advanced competition at the fourth annual Thundering Herd Invitational, hosted by Marshall, at Jeff Small track at the Chris Cline Complex. The Govs 40.5 points placed them seventh out of 12 schools in the event, less than five points behind rival Tennessee State. Appalachian State won the team event with 132 points, with host Marshall placing second (99). Governor track athletes shined on Saturday, including a pair of short-distance runners who found spots on the podium. In the 60m dash, sophomore Tymeitha Tolbert snuck into the finals with a 7.86 qualifying mark, barely beating out teammate Diamond Battle (7.87) for the last spot in the finals and then running a blistering personal-best 7.74 in the finals to take runner-up in the event. Freshman Lennex Walker qualified second with an 8.72 mark in the 60m hurdles, then hitting a personal-best 8.70 for third in the final. 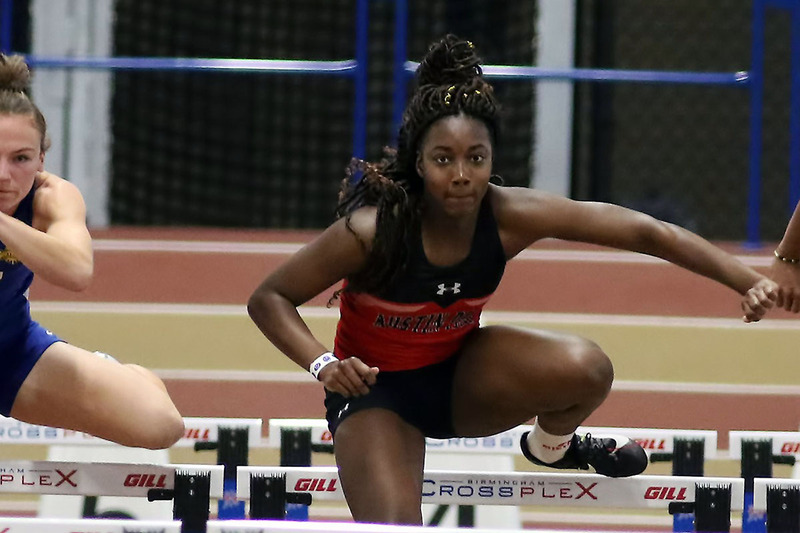 She also placed seventh in Friday’s pentathlon with 3,363 points, including an 8.69 mark in the 60m hurdles for 976 points. In 400m action, freshman Sabrina Richman’s personal-best 57.79 mark gave her sixth place. She, along with sophomore Amelia Thiesing, senior Allysha Scott and freshman Alanna Johnson, won the second heat of the 4x400m relay and finished fifth overall at 3:55.93. Although junior Savannah Amato had a surprising no-height—she passed on the first four heights before hitting the bar on all three attempts from 3.80m—the Govs got nice performances in the pole vault from junior Dascha Hix, who was runner-up with a 3.65m (11-11.75) and freshman Morgan Bradley (fourth, 3.50m; 11-5.75). Also in field event action, junior Nia Gibbs-Francis‘ 1.59m (5-2.50) mark placed her sixth. The Govs will make a return trip to Carbondale, Illinois next week for the Don Denoon Invitational, hosted by Southern Illinois.